Creamy coleslaw with the flavors of Mexican Street Corn! (And no need for dental floss afterwards!). One of my favorite dishes to order at Mexican restaurants is street corn. This Mexican version of corn on the cob is grilled, slathered with Mexican crema (similar to sour cream), sprinkled with Cotija cheese (a salty cheese comparable to feta cheese) and seasoned with chili powder. Wonderfully messy and delicious! This coleslaw recipe incorporates grilled corn along with a slightly spicy but creamy dressing. If you don't want to grill the corn (I just used a grill pan), you could cook the corn kernels in a skillet until slightly charred. 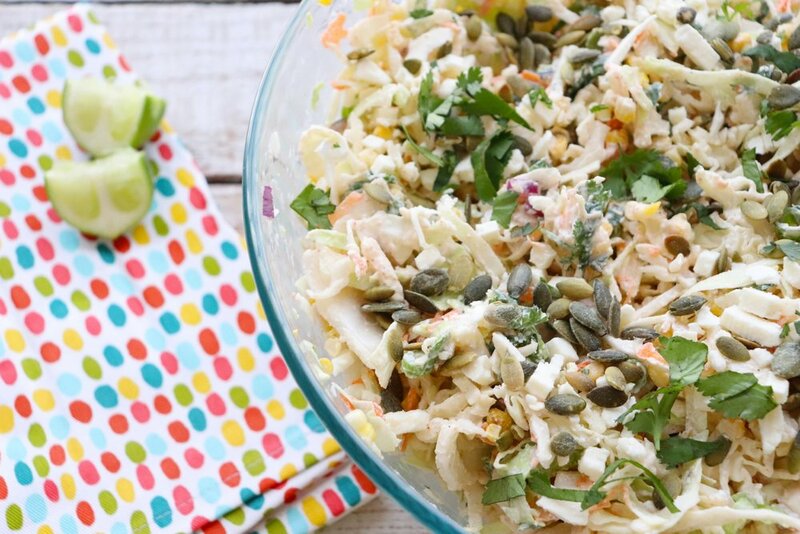 The dressing for this coleslaw uses Greek yogurt and a little mayonnaise for creaminess and lime juice for acidity. Cumin provides a smoky flavor along with a little heat from the chili powder. I topped the slaw with pepitas (pumpkin seeds) and feta cheese instead of Cotija cheese since I didn't see that in the local grocery store. 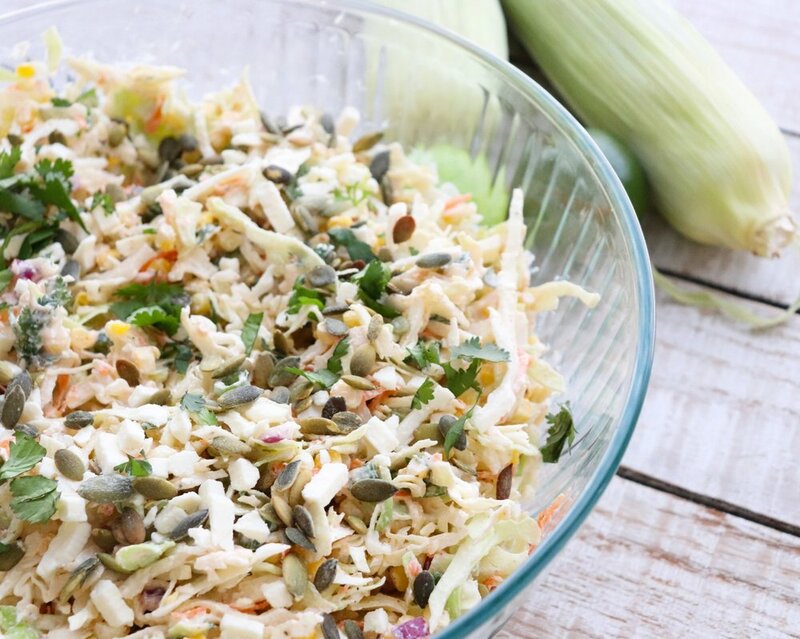 Perfect for potlucks and cookouts, the slaw holds up well and is loaded with flavor. (As you can see, it makes a lot! We kept it in the refrigerator and ate on it over a couple of days. It stayed fresh and crunchy). If you love Mexican street corn like I do, give this coleslaw a try! 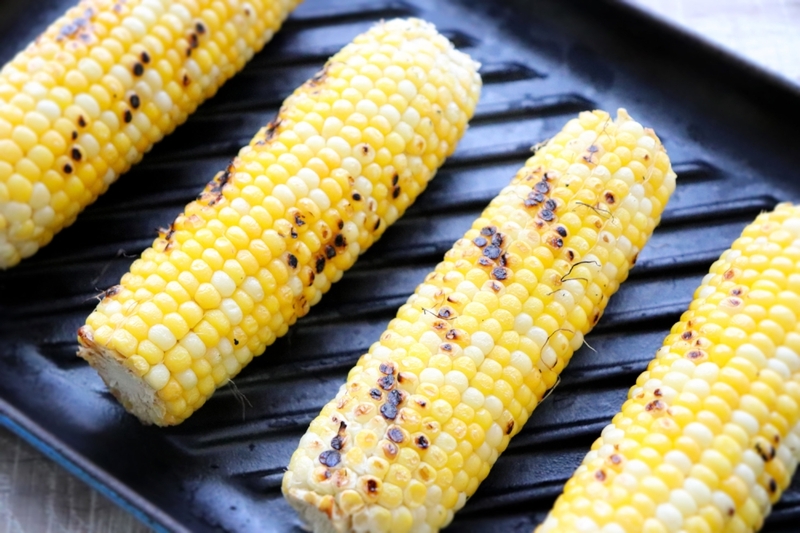 Brush the corn with olive oil and grill over medium-high heat until the corn starts to char. If using frozen or drained canned corn, heat the olive oil in a skillet over high heat. Add the corn and cook, stirring occasionally, until the corn starts to char. Remove from the grill or heat and allow to cool for a few minutes. In a medium size bowl mix together the Greek yogurt, mayonnaise, lime juice, cumin, chili powder, smoked paprika, salt and pepper. In a large bowl place the coleslaw mix, cooled corn, cilantro, green and red onion. Top with the yogurt mixture and toss gently to combine. Top with the pepitas and feta cheese and additional cilantro (if desired).